The number of women who have joined the ranks of firefighters is still hovering at around five percent. This is true even in departments with female chiefs. Why, with these strong role models, are we having trouble recruiting women to join? Here to help answer that on this episode is Cheryl Horvath. She’s c hief of the Tubac, Arizona fire department. 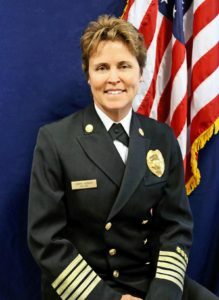 She is a past president of the International Association of Women in Fire and Emergency Services, and served on the International Association of Fire Chiefs’ FRI program planning committee. Cheryl served as an instructor with the Illinois Fire Service Institute for 15 years. Cheryl’s article: Is the Fire Service Biased Against Diversity? In the episode of the TV series “Emergency!” titled “Hang-Up”, John Gage tries desperately to find out how an episode of what television series, also popular at the time, ended? Weird continuity fact: Reed and Malloy, supposedly two fictional TV cops, had already appeared in an earlier episode of “Emergency!” as police officers. How could Johnny have been watching them on a TV show?